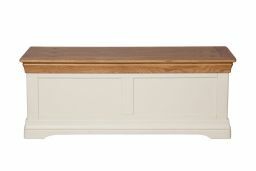 Hand made with a sustainable American oak top which has a hard wearing oiled waxed finish. 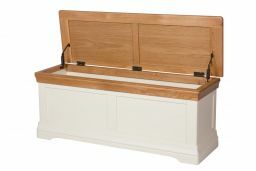 These oak storages boxes are ideal for placing at the end of a matching oak bed. Great for storing clothing or kiddies toys! Delivered fully assembled ready to use. Note: Regular size shown in room set photo. So happy with my purchase of this blanket box. 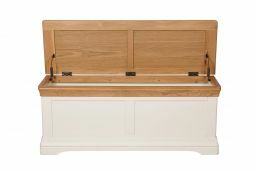 The quality is superb and is a great size to fit at the end of the bed with lots of storage room. Top Furniture were great to deal with and the delivery was on time with a lovely delivery guy. Would certainly recommend and use again in the future. My blanket boxes are perfect for what I need , they look great and the delivery was excellent ,I will be ordering from them again. Great item, about 12" short of the width of my double bed. Perfect size for me. Arrived ready made, just unpack and use. The lid has spring loaded hinges fitted either side which holds the lid up at any angle. Plenty of space for extra bedding, extra blankets, mattress covers, duvets, pillow cases ect. The delivery guys delivered it to the room I wanted it in. You couldn't ask for more. Thank you top furniture. We were very pleased with our purchase. The size and quality of the box was perfect. The personal service and delivery very was also very good would definitely use this company again. Thank you to to Tops Furniture for everything. Perfect product - well made and beautifully finished. The delivery team were polite and very accommodating - even taking both of the boxes upstairs for us. Only problem is they are so nice we are going to have buy some more! Arrived at 9.30am very well packed just as shown in photo. Cannot show you photos as we are in the process of moving house so it has been repackaged. 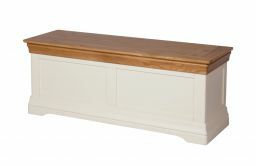 I am delighted with the quality and finish of this blanket box. I have been very pleased with the friendliness and efficiency of Customer Services. Packaging proteced the furniture well and it was delivered during the time slot discussed. I highly recommend this company. Excellent value. Well built box. First box arrived damaged, presumably in transit. Customer service excellent and box replaced immediately with no fuss. Top Furniture apologised and kept me informed all the way through to delivery of the replacement box and collection of the damaged one. I am very happy with the build and finish of this box. Well made, lovely blanket box.